﻿﻿MY JOURNEY﻿﻿: This is my video blog that I will regularly update with stories and insights from "My Journey". ABOUT ME: A brief introduction to who I am, when I was diagnosed with a brain tumor, and why I am doing this site. CONTACT: A convenient way to get in touch with me. Happy New Year, Brain Tumor Fighters! I've updated "My Journey" with Episode 12. In this episode, I discuss fatigue, depression, and how I handled it. Hopefully, what's working for me right now can help someone out there. The results are in from my first post-radiation MRI: "Looks good. See you in 6 months." This was LITERALLY the extent of the email I received from my doctor along with an attachment of the results that were definitely written for only a doctor to understand. Make sure to check out Episode 10 of "My Journey" to hear why I was initially upset with the manner that these results were delivered, but then came around to being very appreciative. MERCH ALERT: I will be pulling the "CYBER KNIFE" shirts from the store page soon and making those available at my band's shows. Make sure to get one before they are pulled! 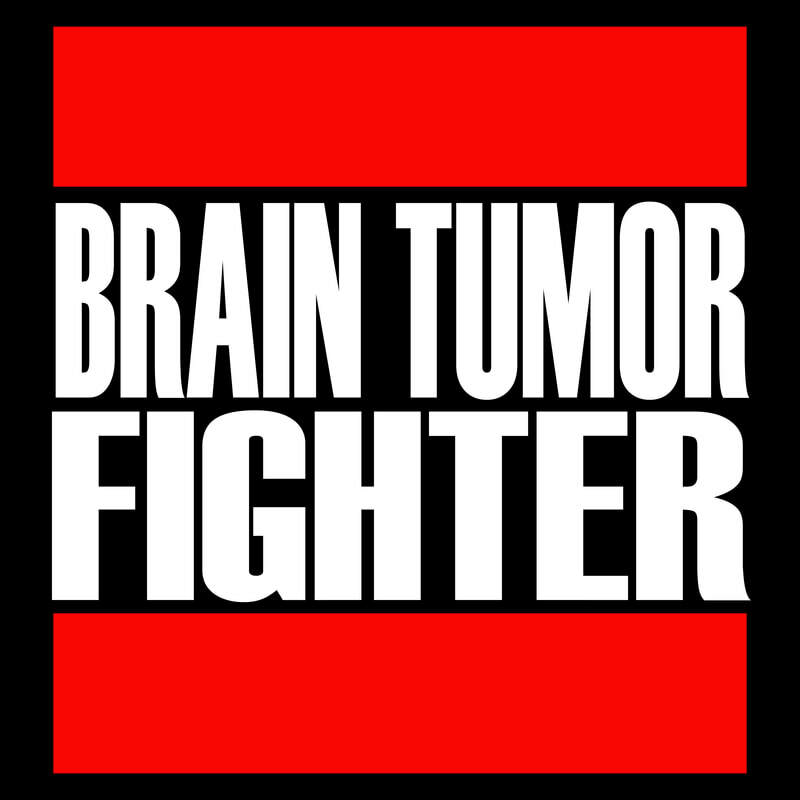 There are a small number of the original Brain Tumor Fighter shirts left as well. The next design will be available after the holidays. What better way to commemorate who we are than by using a Ramones-inspired shirt! Remember, proceeds from the sale of any items on the Brain Tumor Fighter store page go to the Acoustic Neuroma Association. COMING JANUARY 2019 TO THE BTF STORE! I've uploaded the latest episode of My Journey. Please take a moment to see where I'm at in life. To all of my fellow Brain Tumor Fighters, WE'VE GOT THIS! Ladies and gentlemen...please welcome to the squared circle...THE BRAIN TUMOR FIGHTERS!!!! The "Motorhead" shirt was such a huge success that I can know unleash the next shirt design! The bassist of The Moans, Matt, designed this shirt to show his support for me. Proceeds from this shirt sale will go to the Acoustic Neuroma Association! If you need an extra dosage of rock-n-roll in your life, check out my band, The Moans, at the link below. Both the "Motorhead" and NEW "Moans" designs are available in limited sizes and quantities. Don't forget to also check out my Brain Freeze team! Links for the store and Brain Freeze team are found below! JOIN TEAM BRAIN TUMOR FIGHTER ON OCTOBER 13th FOR THE SACRAMENTO BRAIN FREEZE! 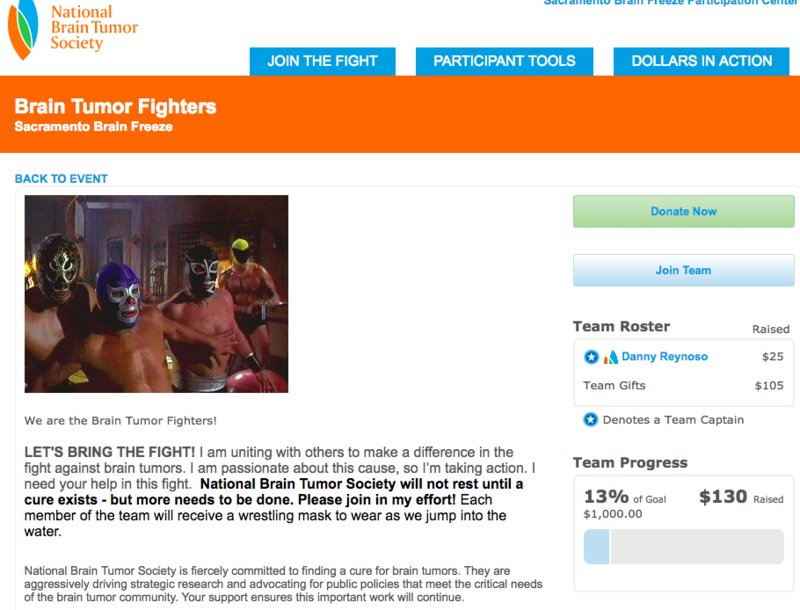 Click the "BRAIN TUMOR FIGHTERS TEAM" button to donate to the Brain Tumor Fighters team, or even better yet, JOIN US and you get a wrestling mask to we as we jump in the water together and raise money and awareness for ALL brain tumor fighters out there! Don't forget to order your shirt from the store page to help raise money for the Acoustic Neuroma Association! "Motorhead" Brain Tumor Fighter shirt is AVAILABLE! Click the STORE link to purchase. Limited quantities in sizes S-XXXL. Proceeds benefit the Acoustic Neuroma Association. Click the button below to go to the store! If you hop on over to the SHOP page, you'll see a few shirt designs that will gradually be made available in LIMITED QUANTITIES! 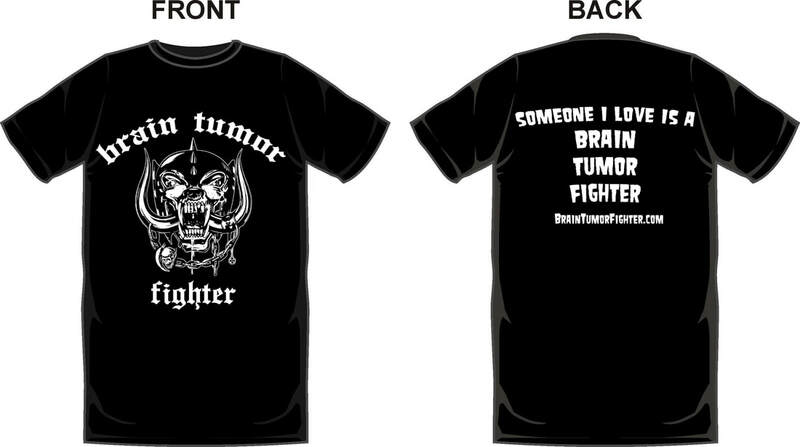 The first design printed will be the Motorhead-inspired Brain Tumor Fighter t-shirt. Across the back will be the words: "Someone I Love Is A Brain Tumor Fighter", so no matter what, you can wear this shirt with pride. Proceeds from these shirts will go to the Acoustic Neuroma Association of America. Sales for this shirt will go LIVE online Friday, June 29th at 5pm. Once again, only a limited quantity of this shirt design will be printed in sizes small-xxxl. Once they're gone, THEY'RE GONE! After they have been on sale for a few weeks, another shirt design will be released. DON'T MISS OUT! SACRAMENTO BRAIN FREEZE: SATURDAY, OCTOBER 13th! I'm putting together a team called The Brain Tumor Fighters to help raise money for Brain Tumor Research by participating in the Sacramento Brain Freeze this coming October 13, 2018. Finished with all 5 of my CyberKnife Radiation treatments today! Thank you to everyone for your support during this stage of my journey. A huge debt of gratitude to the staff at Kaiser in Roseville, CA for their awesome hospitality in making me feel at ease during my treatments. Enjoy the Death Wish Coffee and the cookies that my wife made for you. Three CyberKnife Radiation treatment sessions down, two to go. Make sure to check out the "My Journey" page for my latest episodes. Not sure if you've noticed yet, but there is a "Store" button up top. Nothing is available right now, but over the next two weeks, I'll be offering a few t-shirt designs to choose from. Proceeds will go to the Acoustic Neuroma Association. Go ahead and check out the page to get a sneak peek at a few of the designs! The Moans Cyberknife Shirt...coming soon! Proceeds will go to the Acoustic Neuroma Association. More details in the coming weeks! Well, today is the day. I go in at 3:30 PM today for the first of my five treatments of radiation via Cyberknife. I won't lie. I am nervous, scared, and angry at the cards I've been dealt. I'm putting my body in the trust of Science and technology. Thank you to everyone who have offered me their support. Your cards, emails, texts, hugs, and grey ribbons have gotten me to face this day with more courage than I could have imagined. I will be posting a video tonight (hopefully) to describe the experience of my first treatment. I know it has been way too long since I've updated this website! I sincerely apologize! Please watch the latest video I have posted on "My Journey" to see what I've been up to! The next step of my journey is about to begin! ​MOANS t-shirt with proceeds going to ANAUSA.org coming very soon! Stay posted! Many of my friends belong to more than one of those groups! Right now, I'm still toying with ideas for a daytime fund raising activity that would most likely culminate with a music event with "festive beverages". Although no specific date has been set yet, plan on a Saturday during the month of February in 2018. I am going to be working with a local tattoo artist in designing a BRAIN TUMOR FIGHTER t-shirt that I will make available on this site and at any upcoming shows by my bands, The Moans or Captain 9 & The Knickerbocker Trio. Proceeds from these shirt sales will go directly to the Acoustic Neuroma Association of America in benefitting further research in brain tumors. Thank you for taking the time to read this and stay tuned for more! Brain Tumor Fighter sticker? Brain Tumor Fighter shirt? Who knows! Stay tuned! Regardless, proceeds will go to the Acoustic Neuroma Association.